A medical curtain rail, as one might see in an ER, runs along the periphery of Simone Leigh’s New Museum exhibition called The Waiting Room. Yet, the curtain itself is made of military netting, in sterile white instead of camouflage. The simple gesture tacitly announces that this is not a neutral space, declaring the urgent nature of its existence. Is/was this a militarized zone? Is the stark whiteness of the netting providing camouflage for those within? 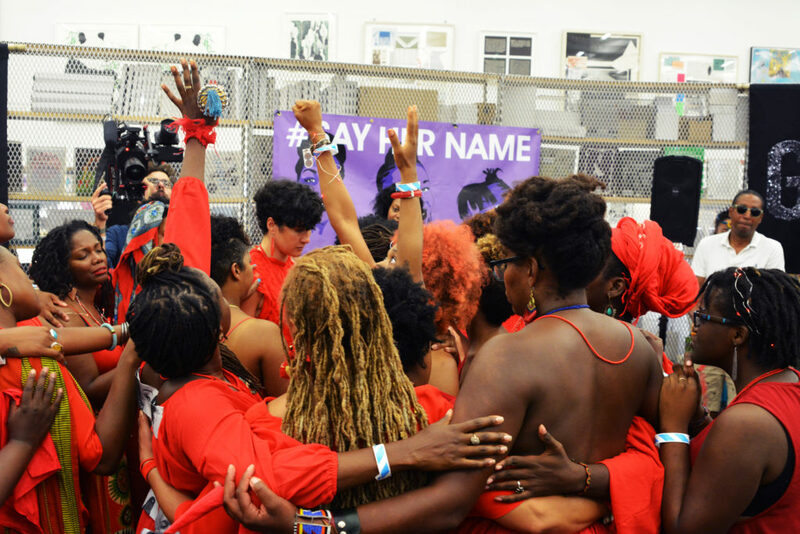 Last night on September 1, in a powerful and vital declaration of non-neutrality, ‘Black Women Artists for Black Lives Matter’ took over three floors of the New York institution in a ebullient display of communal healing, solidarity, and action. Beginning in July of this year, Leigh gathered over one hundred black women artists (a list of whom you can see here) “to form a collective force underground in response to continued inhumane, institutionalized violence against black lives.” The result was an evening of programming, including installations, performances, screenings, and even an herbal tea service. ‘Black Women Artists for Black Lives Matter’ (2016). Photo by Maria Koblyakova. Courtesy New Museum, New York. BWA for BLM was one of many events organized by Leighas part of her residency at the museum. Her exhibition, running June 22 to September 18, acts as a hub for these events, offering an alternative, inclusive space for physical, spiritual, and emotional healing, particularly focused on the experience of black female subjectivity. 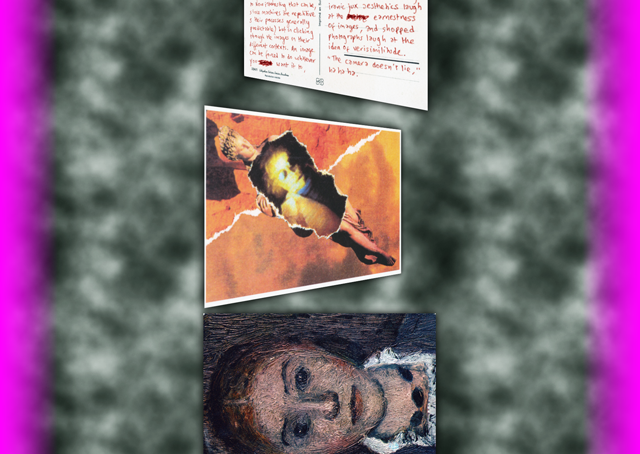 While it may sound optimistic, Leigh has carefully articulated a space where past traumas and transgressions are not pushed aside, but are instead situated in a delicate morphology that actively integrates the cause of societal/personal/bodily trauma into the site of communal/spiritual/therapeutic healing. And the black female body acts as the locus for this transitional, healing moment. For instance, a black Clonette doll (which is a relic of colonialism, but also proof of a cultural appropriation that adopted it as talismanic protection for pregnant women) is placed amidst shelves of medicinal herbs. An image of a Mammy-shaped building (an icon of American slavery and its legacy, but also of black maternal care) is elevated to totemic status with its African counterparts, and projected before rows of meditation pillows. The slippage of time in these iconic images and objects, allow viewers to see the cause of a societal wound, and to see the possibility of life beyond it simultaneously. ‘Black Women Artists for Black Lives Matter’ uses a similar strategy of merging past and present, victory and defeat in the evening of programming, screenings and installations. 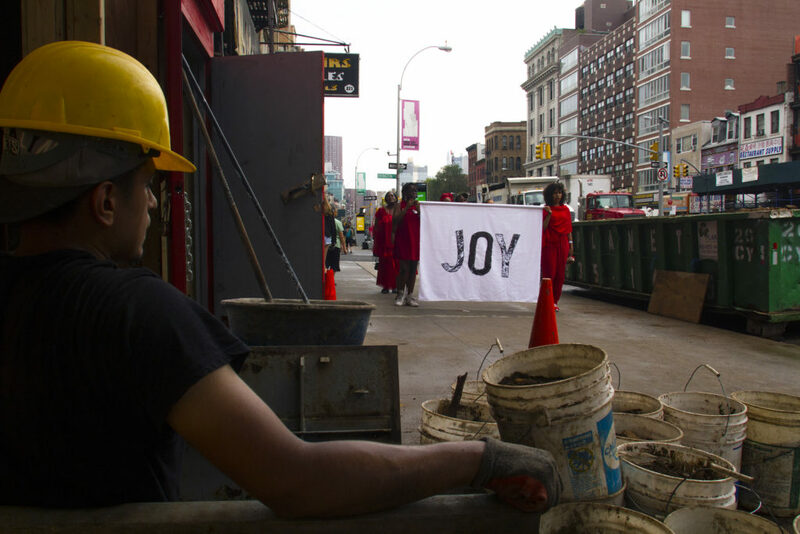 Upon entry, two sequined flags (which are frequently used in Vodou ritual) flank either end of a long central wall in the lobby, reading “JOY” and “GRIEF”, respectively, highlighting two poles of intense feeling, but also two valid modes of resistance to oppression. I find myself wondering whether rage also has a place here. ‘Black Women Artists for Black Lives Matter’ (2016). Photo by Madeleine Hunt Ehrlich. Courtesy New Museum, New York. 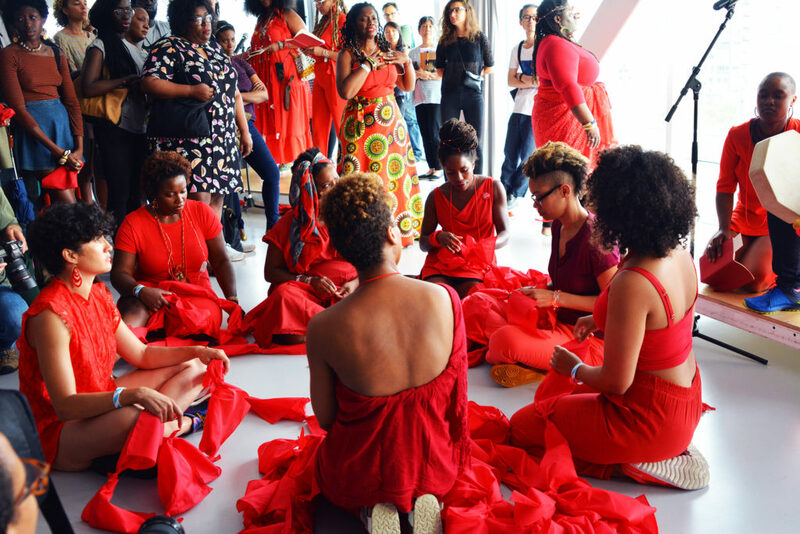 The ‘Black Women Artists for Black Lives Matter’ event was on at New York’s New Museum on September 1, 2016. Header image: ‘Black Women Artists for Black Lives Matter’ (2016). Photo by Madeleine Hunt Ehrlich. Courtesy New Museum, New York. Artists, critics and entrepreneurs gather to discuss the cultural implications of distributed databases in the sold-out ‘Blockchain Horizons’ discussion at New Museum on October 22. Organized by Rhizome Artistic Director Michael Connor and conceived by Lars Holdhus, ‘Blockchain Horizons’ takes on the social and cultural repercussions of these databases, understood to be secure and transparent by virtue of peer-to-peer communities that cryptographically validate each entry, in various fields, including publishing, licensing and distribution. Participating in the discussion are Nora Khan, DeForrest Brown, and The Actual School with a work-in-progress online project titled ‘Futures Along the Blockchain’; artist, entrepreneur and founder of Monegraph, Kevin McCoy; PWR presenting a decentralised platform for publication and distribution of digital texts; and researcher and curator Rachel O’Dwyer. The Infinite Webring of the Eternal Internet Brotherhood, A project by Angelo Plessas interpreted by PWR, 2014. New Museum is putting on its third Triennial exhibition, titled Surround Audience and running at the NYC space from February 25 to May 24. The international exhibition specialising in early-career artists (and the only recurring one of its kind) is organised this year by New Museum curator Lauren Cornell and artist Ryan Trecartin, featured in the inaugural 2009 Triennial. The two art figures have worked together for nearing a decade and the Triennial’s title is, for Cornell, inspired by the Trecartin’s own work which “vividly manifests a world in which the effects of technology and late capitalism have been absorbed into our bodies and altered our vision of the world”. 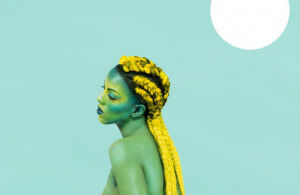 Among the 51 participants coming from over 25 different countries are many whose work has been specifically commissioned for the show, including Juliana Huxtable, Geumhyung Jeong, and Eduardo Navarro, who participated in research and production residencies associated with New Museum, as well as works by Eva Kotátková, Shadi Habib Allah, and Aleksandra Domanović. Other familiar names include Sophia Al-Maria, Ed Atkins, Rachel Lord, K-HOLE and more. Following a big first wave of events and exhibitions last week, there are still more to come, alongside London Art Fair this week. Those include Amitai Romm at V4ULT in Berlin, as well as a music event, hosted by producer Jacques Gaspard Biberkopf and featuring live and streamed DJ sets at Panke. 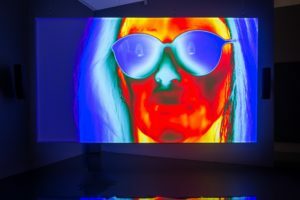 Exhibitions opening in the German city include one by Jaakko Pallasvuo at Future Gallery and Nicolas Ceccaldi at Mathew Gallery, while in London Monira Al Qadiri curates Jaykar: The Cheeky Video Scene of the Gulf to close the Never Never Land exhibition at EOA.Projects. Kim Asendorf and Ole Fach are showing at Carroll/Fletcher, with an opening performance by Helen Benigson, and Phoebe Collings-James has a solo exhibition at Italian Institute of Culture. Elsewhere, Harm van den Dorpel, Keith J. Varadi and Cally Spooner have exhibitions across LA, New York and Milan, respectively, and Queer Thoughts has organised a group exhibition across three different locations in Nicaragua. Header image: Jaykar: The Cheeky Video Scene of the Gulf @ EOA.Projects. Monira Al Qadiri’s socio-ethnic study of affect is central to her work. 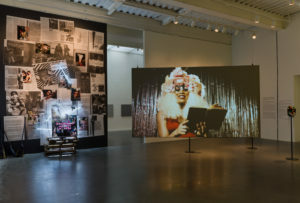 Often looking at themes connected to mass media, sadness, and what the Beirut-based artist calls “masculine narcissism,” much of her art –produced both in the Middle East and during her 10 years studying in Japan –explores the political contrast between East and West, and how different emotions are portrayed and valorised. 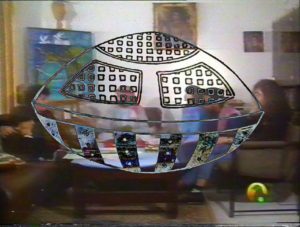 A founding member of eight-strong Gulf art collective GCC, Al Qadiri is speaking to me over Skype from her flat in the Lebanese capital, where she’s been living for the last three years. She’s just returned from New York where the group are showing at the New Museum’s Here and Elsewhere, a bit jetlagged, but still happy to discuss her work. Her recently launched video called ‘Soap’ (2014) for Creative Time Reports manipulates footage from soap operas shown in the Gulf region, and inserts a crucial missing figure: the migrant worker. Al Qadiri tells me that nearly everyone in Kuwait has hired help, due to excessive wealth, but these TV shows depict a very different reality: one where families cook for themselves during Ramadan, and the maid is entirely absent. She looks at the exported image of Kuwaitis, compared to the real situation on the ground. Your work often focuses on the theme of sadness in the Middle East, displayed usually by a masculine character who you portray. You deal with issues of narcissism – I’m interested in why it has to be the male character for you? Monira Al Qadiri: I was living in Japan for a long time and I was thinking about how Western culture is saturated with this oppressive happiness. But, for example, in the Arab world – even in Iran and Turkey – sadness is seen as something noble and beautiful. A lot of poetry and songs are all about sadness and loneliness. It’s always about this tragic character, and it’s very narcissistic. So sadness isn’t seen as an illness or a disease. It’s seen as something beautiful and almost self-indulgent. I was thinking about that a lot and then I decided to research it. My doctoral dissertation was called ‘The Aesthetics of Sadness in the Middle East’. I thought that the best thing to represent this aesthetic is music and songs from the region, so I decided to create a lot of music videos using these masculine characters. I think of melancholy and narcissism as having a direct relationship. Then I thought what is narcissism to me: narcissism is something masculine. I don’t know why that came up in my life. I think it came up during the war in Kuwait. I felt like the men were doing everything, and that’s really cool, and the women are just stuck at home, hiding. Of course this is a weird thing that happened to me but I linked the psychological state of narcissism to gender. I find that really interesting and I wanted to look into it. 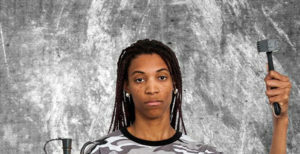 When you think about stereotypes, like cross-dressing: men cross-dressing as women are always considered comical characters, while women as men are seen as this strange character you can’t really place. It’s mysterious. These stereotypes are interesting, how gender is facilitated like that. Monira Al Qadiri, Still from ‘Wa Waila (Oh Torment)’ (2008). Are you starring in most of the music videos? I couldn’t tell exactly, you did the drag so well. It’s interesting that you self-identify with these narcissistic characters by portraying them personally. MAQ: Yes, of course! I always like to be honest in my work, not be hypocritical. I don’t like to be the one looking at it, I want to be part of it. It really is also about me, and I want to show that. It’s not just like being an observer. I want to see how it looks when I’m doing it also. The costumes, everything is very broad and rudimentary, almost trashy and cheap. I don’t like when things are so well designed or choreographed. It gives a more human touch when things are that cheap. I think the trashiness of it highlights all the mismatching ideas that are going on. The make-up isn’t quite right and the costumes are a bit off. There’s this Ali Baba thing, and everything is not quite right but in the end it creates a beautiful picture. I really like your recent ‘Myth Busters’ (2014) photo series, can you talk a bit about that? MAQ: That was a commissioned project by Ibraaz. The issue was about future infrastructures of art in the Middle East, like museums. I thought about it a little bit and remembered a lecture my friend Alexandre Kazerouni gave. He’s a French-Iranian scholar and he was talking about how the war in Kuwait was actually the trigger for this museum rush in the Gulf. These are two things that are very large in my life: the war and art museums. They were becoming one in this talk and I wanted to visualize it. He spent six years researching the history of museums in the Gulf and the new mega art museums – some of them are just on paper and they may never be realized. For him, it was a political statement: before the war museums were focused on local audiences and it was really about Arab culture and heritage, a little bit about Islam, local dioramas of old streets, and trying to re-enact pre-oil times. But after the war, the Gulf states couldn’t protect each other from aggression so they had to hire foreign armies to come and liberate Kuwait. So this changed the focus to Western audiences. The new museums are always in English and focused on an industry of tourism, rather than on Kuwaitis, or Qataris, or Emiratis. It’s always about foreigners who are going to come and see this. For him it’s a political idea, it’s his theory. Monira Al Qadiri, ‘Myth Busters IV’ (2014). So this theory informed your photos? MAQ: Yes, and I have a new interest I’m focusing on, which is my biographical relationship to oil. Of course the war was part of it. I had a film called ‘Behind the Sun’ (2013) which is about the burning oil fields after the war. I was linking it to Werner Herzog, because he made a film about that. I didn’t like it at first. It’s called ‘Lessons of Darkness’. It’s an amazing work and I love it so much, really. Initially I didn’t like it because I had no idea who Herzog was and I was watching it as a kid. We had it on VHS. It was right after the war. And I watched it: basically he’s narrating this sci-fi story over the images of the burning oil fields he shot. It’s amazing footage with a kind of Wagner soundtrack. He has a very special voice, and it’s all about apocalypse and this stuff from the Bible. As a kid who just went through the war, I was like: ‘Why is this old man lying? What is he talking about?’ I hated it for so many years but then I watched it again, and again, and again. I started to understand that it’s very interesting to look at political events in a completely other way, expanding their meaning. I think it’s a very redeeming thing to do but, at the same time, I still had that confusion in myself. So I decided to make my own version: ‘Behind the Sun’. 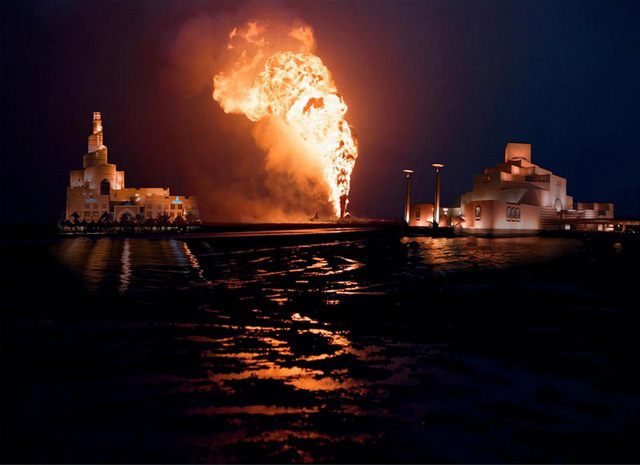 It’s basically a narration of Islamic poetry from television stations at the time that I took from the TV archives, and I superimposed it on to images of the burning oil fields from an amateur videographer from the time. Nobody has ever seen these videos before. He’s a photographer, and he’s amazing, so he stashed them away in his archive because he felt they weren’t interesting. His name is Adel Al-Yousifi. He said he didn’t have any videos, but eventually he had these old VHS tapes and he said no one has seen them and they are probably awful. But they were just amazing. It was really a metaphysical experience to see them. Have you shown ‘Behind the Sun’ anywhere yet? MAQ: I showed it at the Beirut Art Centre at this show called Exposure, which they do for emerging artists in Lebanon every year. I just proposed it to them as a project and they accepted it. I’ve been living in Lebanon for three years so I think about the war a lot. I didn’t think about it when I was in Japan. Despite everything that happens here in Lebanon, people still keep going. Is living in that kind of environment refueling your interest in the war as subject matter for your work? MAQ: Of course – coming from Japan was like moving from zero political reality to a hyper-political reality. In Japan I was asking people why aren’t you interested in politics, but they thought it had nothing to do with them. Here, if you go out to a local Kebab shop, there’s a sign that says: “Don’t discuss politics.” Lebanese political talk shows are the most complicated things I’ve ever seen. Japan feels so detached from the world, which is awful. But I guess things have changed since Fukushima, people are more politically aware. In Japan I was upset it was so detached from the world, and here it’s too much. Would your work be perhaps more political in a setting where it’s detached from your daily life? MAQ: Yes, that’s exactly what was happening. I guess in Japan I was thinking more about economics whereas here I think more about conflict. In Japan this hyper-capitalist lifestyle really dominates and there is no other way to live. For me that was horrible to see: a lot of my friends who were artists and filmmakers would become corporate zombies immediately after we graduated, because they had no choice. Especially in Kuwait, you can get a salary for doing nothing because it’s almost a complete welfare state. 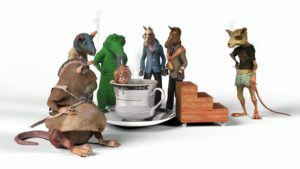 These things are different and sometimes it’s like Werner Herzog, it’s good to look at politics in an artistic way. This relates to your work with the art collective GCC. There’s a clear connection to your solo work, though you deal on a sometimes more personal level, you have these political, performative gestures that are about self-promotion, either personal or as a state body. The GCC uses this bureaucratic or diplomatic language. MAQ: GCC is a labour of love, all of us were working together on individual projects. We were helping each other out –like if I needed an architectural sketch I would ask my friend, or if someone needed a video… we were always working together for such a long time that it started to make sense that we work together as one. It became very successful. We want to talk about what’s happening within the Gulf. It’s very private, yet everyone has an opinion about it. A large part of that comes from conflating states with corporations. Gulf states, nowadays, they act like companies. They have their PR campaigns, like Fly Emirates, and they have this objective image. It’s very obvious in the Gulf but of course all states do that. Global diplomacy is all about this luxurious setting where world leaders talk about nothing. So we ask, what does it mean to be a state? 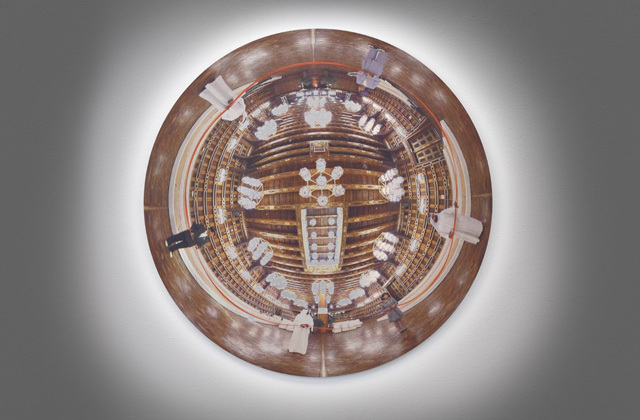 GCC, ‘Ceremonial Sphere 1’ (2013). Courtesy the artists and Kraupa-Tuskany Zeidler, Berlin. Photo- Hans-Georg Gaul. I was attending a lecture at Campus in Camps in Dheisheh refugee camp in the West Bank, and the speaker Yazid Anani was talking about this “performance of the state” happening there, specifically by the Palestinian Authority –architecturally, in uniform and in their projected image. They are trying to enter the economic or political state game through these signifiers that are not actually representative of the lived reality. The GCC seems to be doing a similar performance, but more as a critique. MAQ: This kind of aesthetic rules our lives and we want to think about that. It’s not just coming from a point of criticism, we grew up with these images. We really just want to excavate them. It’s really like archaeology. What do these images mean? Where does ribbon-cutting come from? They are so outrageous and also beautiful. We also love these images. My work deals with personal experience but also ideas about gender and things that I experience. I look at narcissism as a collective thing, though. I’m really anti-individualism. So I’m criticising that also, I think that’s a dead discourse. I use myself as a filter of that. GCC is also part of that –it’s a collective experience of the Gulf, made up of eight artists. Monira Al Qadiri is a Beirut-based artist. 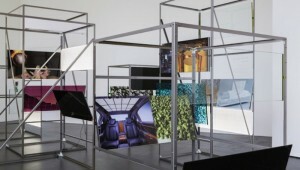 Her work as part of the GCC is currently showing at the New Museum’s Here and Elsewhere exhibition in New York, running July 16 to September 28, 2014. Header photo by Yasmina Haddad. Courtesy Monira Al Qadiri. 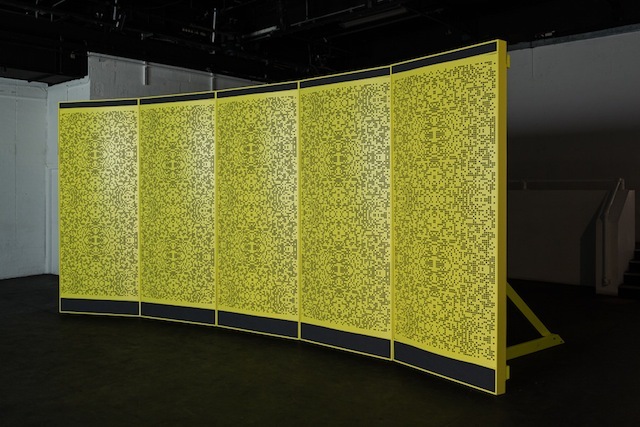 From April 23 to June 22, UK artist Hannah Sawtell will enjoy her first solo museum presentation, “Accumulator”, in the Lobby Gallery of NYC’s The New Museum. 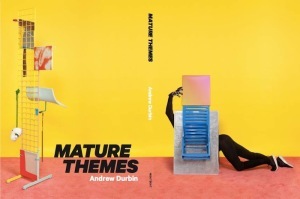 The multimedia artist—often working through installation, video, print, sound, as well as performance—explores the relationship between the surfaces of objects and images and their multifaceted underlying structures. As The New Museum describes the artist as “render[ing] the fluidity of digital images with spatial, physical, and temporal qualities, and critically point[ing] to their function as decoy indicators for larger and dominating systems of production, access, surplus, and consumption”. The vaguely industrial aesthetic of Sawtell’s work is a further allusion to the repetitive systems of production, and the artist’s previous work as a DJ and part of Detroit’s Plant E Label lends to her art the grating and dynamic rhythm and noise that bolsters her video work and performances. “Osculator” (2012), installation view. Image courtesy ICA. 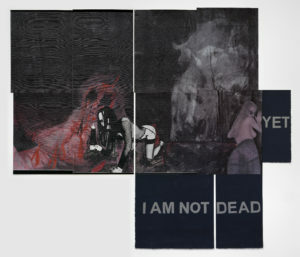 Header image: “Vendor” (2012), installation view. Image courtesy Bloomberg Space. 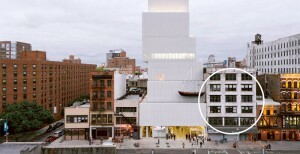 Replicating the development plans of a ‘startup incubator’, New Museum has opened a not-for-profit work space New Inc., next door to its Bowery space and set to cater to emerging practitioners working across art, design and tech, with applications for 12-month residencies closing April 1. As a cultural hub of “new art and new ideas”, director Julia Kaganskiy leads the project with a focus on fostering collaboration in this vital and dynamic space between platforms, where digital artists, technologists and designers can collaborate. The intention is to produce both ideas and events, which promise to provide both interesting results and greater potential for cultural impact.